Sue Blake dropped two dress sizes! After several years of no exercise due to a back injury, I was introduced by a friend, to Zumba dance with the wonderful Gail Nicholls. I was nervous to begin with and very unfit but Gail described the classes as ‘free style’ and a chance for a ‘wiggle & giggle’ whilst having fun. In no time at all I was hooked and had confidence to progress to other classes. In September 2012 I took the plunge and booked some Personal Training sessions with Gail to build up my fitness and get back to the shape I used to be. Gail tailored the PT sessions to suit my needs and support my back. 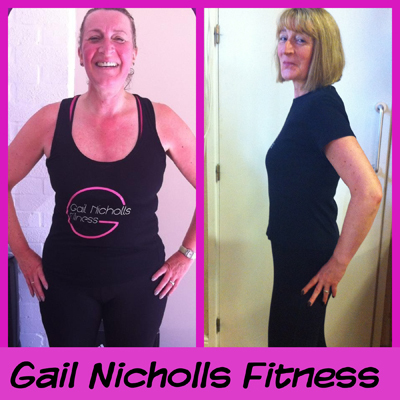 Over the next 10 months with a mixture of one to one sessions and classes, coupled with Gail’s superb training techniques and support, I lost 2 stone, 26 inches and totally changed my body shape. Not to mention dropping two dress sizes!! I now maintain my fitness levels with a sensible practical diet and a mixture of classes with Gail to suit my working pattern. My favourite classes are the new Boxerbeat and Beat HIIT which give you a good body workout but Zumba dance is where I started and always makes me smile.